Four days to go till Christmas! Everyone’s doing their shopping and buying Christmas presents for their loved ones. Are you done with Christmas shopping? I’m done wrapping all the gifts for my family and friends and I’m always excited for our little get together every year. 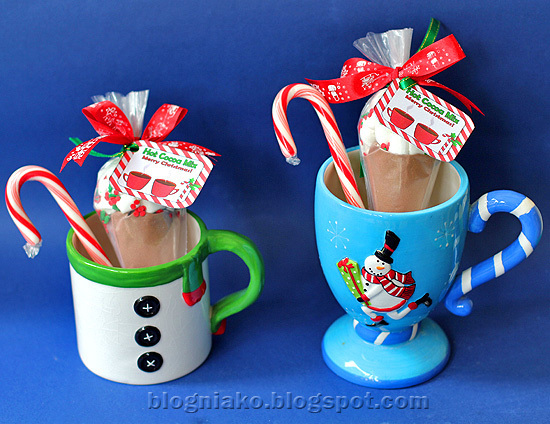 I purchased some christmas themed cups and mugs and thought of making hot cocoa cones for my cousins and some friends to give this Christmas. I filled the bag with chocolate powder and secured with rubber band. 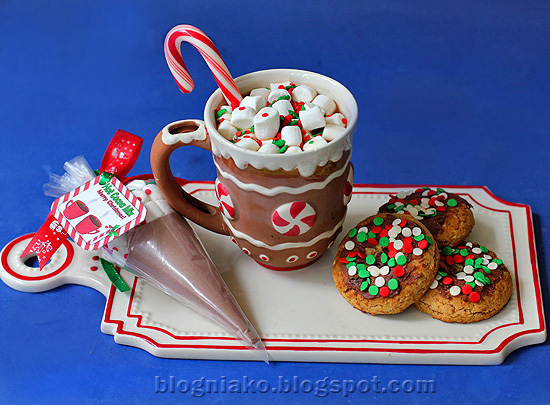 I put the cocoa bag into another pastry bag and poured some marshmallows and sprinkles. After securing tightly with a rubber band, I added some decorative ribbon and tag. best paired with your favorite cookies! Anney! Anney! Anney! OMG! Nung nagsabog ng creativity si Lord gising na gising ka. As always, you never fail to make my jaw drop. I'll copy ha?! for next year. hahaha. Where did you buy those cute mugs? This is such a nifty idea! 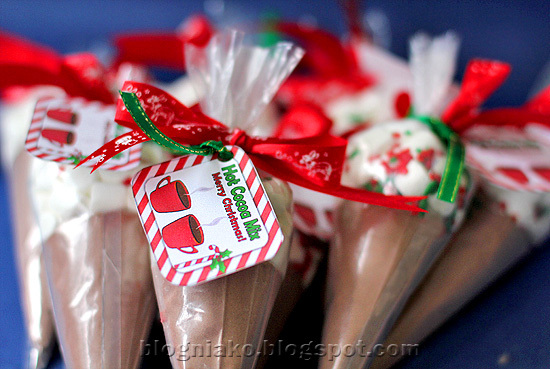 😀 Love the cocoa cones in the mugs.. <3 It's very creative. 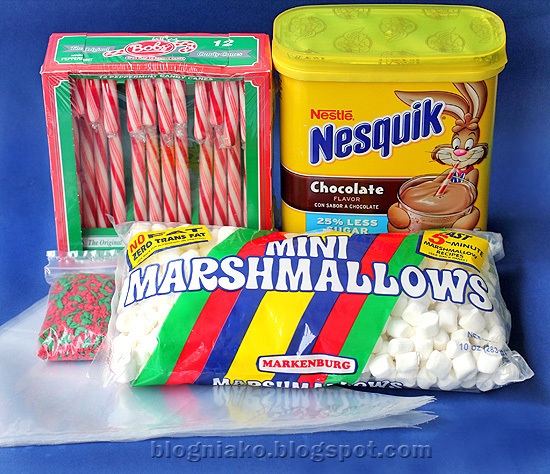 oh anney give please send mo one for christmas.. haha.. nalaway ako sa hot choco with marsh mallows.. I love it.. galing galing.. I'm done shopping. I haven't wrapped gifts yet. I can't believe it Christmas already. So cute! 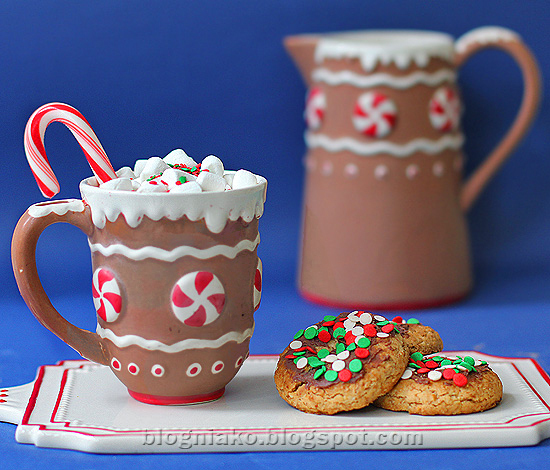 Especially that gingerbread cup! that's a nice gift ideas for kids, thanks for sharing! patok to sa mga mag-syota..
ikaw na anney! =) thanks for this idea, pacopy din for next year. hehe! pwede pa-seminar? kaya lang ang pagiging creative mo hindi pwede makuha sa seminar yan e:-). Wow ang cute! Magawa nga itez! 😀 Hihi! Dapat magkashow ka na sa TV tapos magtuturo ka ng mga ganito. Hihi. 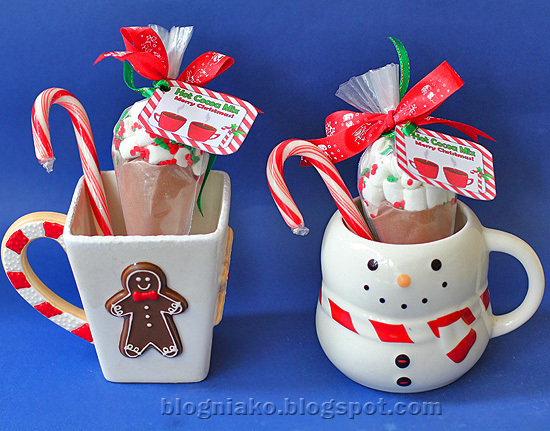 ang cute ng mga mugs!!! i collect mugs and sana meron akong ganyan.. naku..hindi pa ako nakakapag-Christmas shopping! walang pang shopping! lol! ang galing ng idea. nabasa ko din itong idea na to in one of the cookbooks i bought eons ago… hehehe… Merry Christmas to you and your family! ikaw na ikaw na Anney! just another brilliant idea.baka magulat na lang kami mamaya may own show ka na.hihi! Blogs About Success , Motivational , Inspirational , Poems , Love , Life. I'm sure it's a very nice idea for us who needs an inspiration from a creative woman like you. 🙂 you are such an inspiration for many! Super creative talaga! Pero kung gagayahin ko 'to, mahihirapan ako kasi traditional sa amin ang Antonio Pueo, since tablet sya kailngan ko pa magdikdik. haha Pero I super like the idea! Ooo…so pretty! Don't mind getting one for Christmas. A Blessed Christmas to you and all in your family. Thanks Anney! I wish you and your family a happy Christmas too..you are so creative and very talented, I hate you! lol! i love them!!! 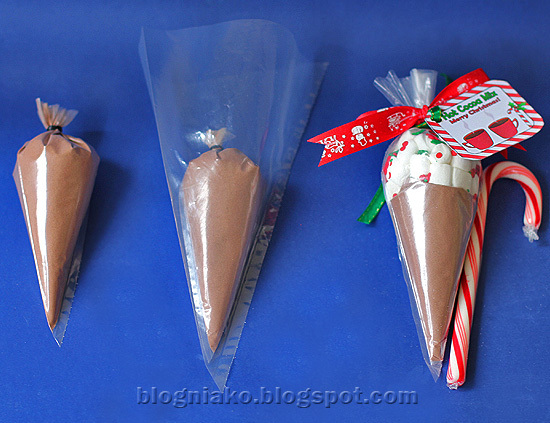 frustrating lang talaga here kasi i cannot find easily those things here… hindi uso ang candy cane, hindi uso ang marshmallows, hindi uso ang mga makulay na bilog bilog, etc… kaya naman pahirapan… merry christmas! hi Anney! syempre ganda pa din ng idea mo, very creative, malayong maisip ko yan hahaha…i bought my ceramic egg tray sa isang store near us that sells all kinds of ceramics. mura sya dahil ang mga cake stands ay mabibili mo lang ng 250.00 compare to other stores na mga 800 ang isa. mahilig ka din sa anik anik? heheh sana exchange gift tayo hehhe..mwah! Ang bongga mo talaga, Anney! Bilib na bilib ako! This blog is so full of creativity and ingenuity. Way to go!